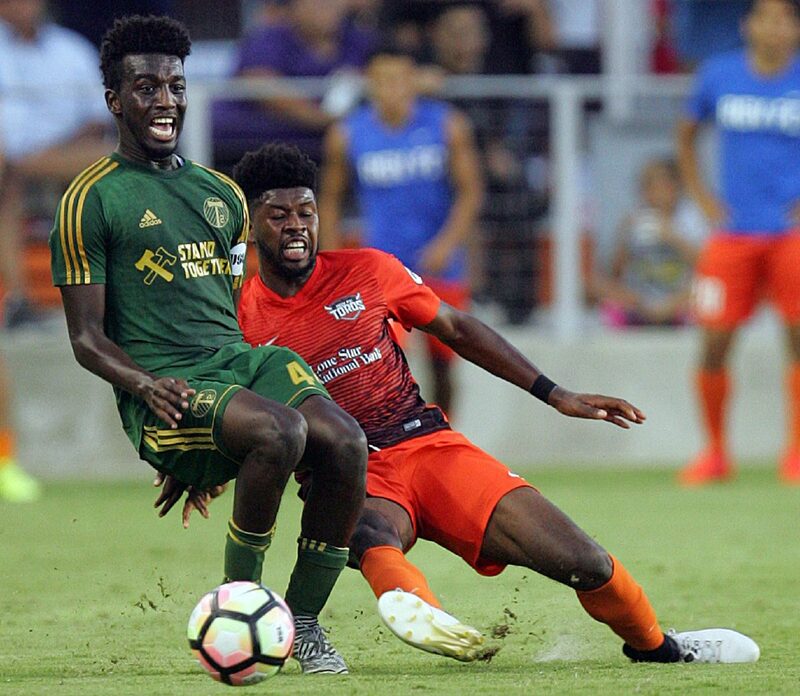 EDINBURG — When new RGV FC coach Gerson Echeverry began his tenure as Seton Hall’s head coach in 2012, current Toros defender Kai Greene was a sophomore for the Pirates. Greene hadn’t been highly recruited out of high school, and Echeverry knew the defender had quickly developed a reputation for being humble and hardworking. Greene wrapped up his career at Seton Hall in 2014 and has played for RGV FC each of the past two seasons. Echeverry, meanwhile, continued to coach at Seton Hall through the 2017 season before being appointed as RGV FC’s next head coach in December. Six years after they first took the pitch for the same side, Echeverry and Greene did so again on Saturday when the RGV FC Toros faced their MLS affiliate Houston Dynamo at H-E-B Park. Greene continued to live in New Jersey after graduation, so he and Echeverry occasionally kept in touch. When Greene was looking for a team in 2016, Echeverry made a call to then-Toros coach Wilmer Cabrera, an old friend who is now the head coach of the Dynamo. Because of his connections to both Greene and Cabrera, Echeverry watched a few of RGV FC’s games during the team’s inaugural season. When Echeverry landed the RGV FC job, Greene gave him a few ideas about what to expect in the Valley. Green said his existing relationship with Cabrera and his previous background with Echeverry made the prospect of coming back to RGV FC for another season very appealing. He added that Echeverry is similar to Cabrera in that both are very blunt and value grit. Both are also accomplished former players, with Echeverry reaching the MLS during his six-year playing career. Greene has proven he can play with just about anyone in the USL, too. Last year, he appeared in 25 games and led the Toros with 93 tackles — 32 more than the next highest RGV FC player. Echeverry said Greene is a terrific athlete with an aggressive mentality who is constantly working to plug any holes in his play. Echeverry is also working to prove his worth, stepping into his first job at the professional level after eight seasons as an assistant and six years as the head coach at Seton Hall — his alma mater. His overall record as the head coach at Seton Hall was just 28-64-11, but the professional environment is vastly different from college. The athletes have higher aims, coaches don’t have to worry about NCAA restrictions and players going to class, and the resources and facilities are vastly superior, Echeverry said. Echeverry said he wanted to focus on community engagement. Greene regularly visits the Evins Regional Juvenile Center and told Echeverry he believes the organization should become more involved in the Valley. Another of Echeverry’s responsibilities, of course, is to win. The Toros finished their inaugural season 14-7-9 for a second-place ranking in the Western Conference before last year slipping back to 9-15-8 to place 11th in the standings.